Top quality A2 stainless steel. Selection pack available 86732 . Stainless Self Tapping Countersunk Pozi Screw 1 1/2" x 8 (100 Pack) is rated 4.7 out of 5 by 22. Rated 5 out of 5 by Rockhopper from Excellent Screws Really good. They seem to be identical to those supplied at a higher cost to the marine trade. Rated 5 out of 5 by Pinkie from Stainless Tapping Countersunk Pozi Screw 3/4" x 8 I bought these for a specific job and they were just what I wanted. Rated 5 out of 5 by Pinkie from Stainless Tapping Countersunk Pozi Screw 1" x 8 I bought these for a specific job and they were just what I wanted. Rated 5 out of 5 by Rob J from Great Screw. Good Quality at a quality Price, will DEFINITELY BUY AGAIN. One reviewer stated he found them SOFT which is strange as Stainless is a hard material, he should try using the slower speed on his drill to prevent Cam out , also he states that Torx heads are better , not in my experience there not, as I found they DO shear. Rated 4 out of 5 by Rob J from Great Screw. Good Quality at a quality Price, will DEFINITELY BUY again. Rated 5 out of 5 by John48 from They do the job The screws were needed for side panels on an outhouse roof where plastic caps on galvanised screws had disintegrated and the screws had rusted. Even if the new caps disintegrate, these screws should not corrode. 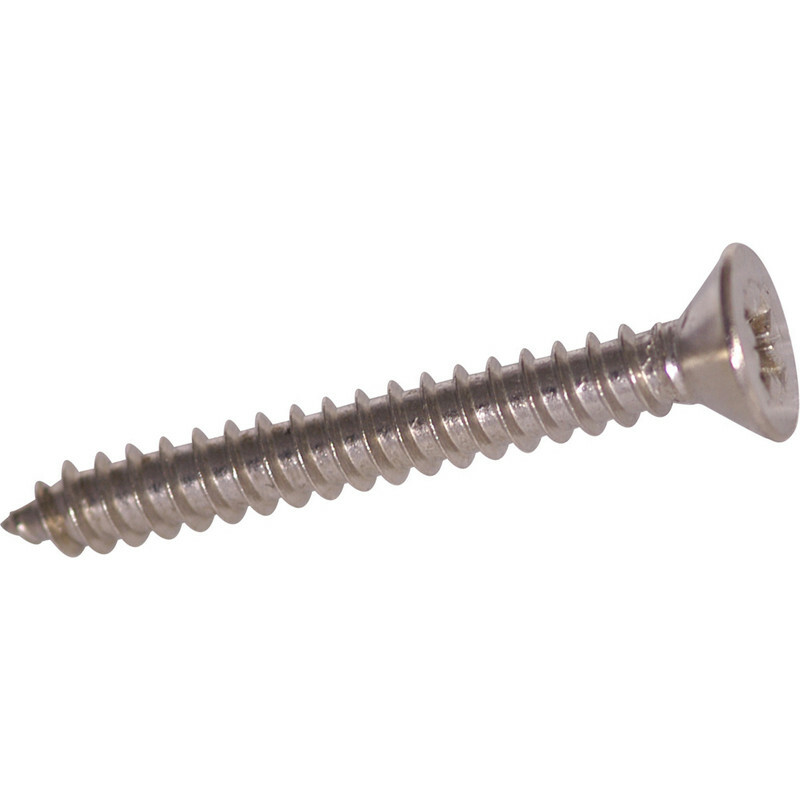 It is worth the extra cost using stainless screws in exterior applications and in damp environments for peace of mind, and these ones are much cheaper and probably just as good as those from DIY outlets.